Owen Connell has long been a staple on Capitol Hill. His paintings, graphics, and unique tattoo work are sought after locally as well as globally. 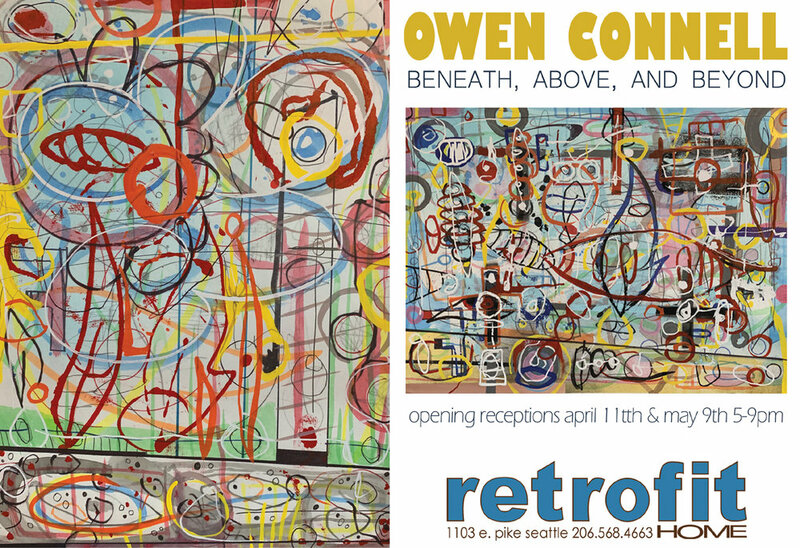 In his most recent show entitled "Beneath, Above, and Beyond," Owen uses an expressive mid-century color palette that manages to capture beautiful order out of seemingly frenetic energy. His bold and distinctive style are unmistakably Owen Connell. Champagne receptions on Thursday April 11th and Thursday May 9th, 5-9pm, artwork showing thru the end of May. The 14th annual Hundred & Under group art show started on Thursday, December 13th. This year, we are featuring 14 local artists with a ton of pieces for $100 or under, so come start a new art collection, add to an existing one, or snag the perfect gift for all of those special people on your holiday lists. Mixed media by: Joey Brooks, Nicole Trimmer, Jeff Farnham, Claudio Duran, Kristen Winn, Narboo, Starheadboy, Jesse Link, Christine Olson, Twozdai Hulse, Andrew Schons, Urban Soule, Greg Pergament, and Zoe Brooks. Show runs from December 13th through February 10th, with pieces available in-store only! Join us for a champagne reception on January 10th to celebrate Capitol Hill Art Walk, 5:00pm - 9:00pm. Narboo, Joseph Brooks, and Starheadboy each use bold color choices and line acrylic paintings on canvas and wood. Many of these pieces are heavily influenced by nature, urban environments, graffiti, comics and cartoons. Don't miss the chance to see these three iconic Seattle artists together for one show! This show runs through Aug. 5th.